The Navy's helicopters are involved in anti- submarine and surface warfare, reconnaissance and surveillance, transporting people and equipment, search and rescue and aeromedical evacuations. Helicopters significantly increase the capability of ships to see over the horizon to get an early warning of possible threats. Currently the Navy has 16 Seahawks, 7 Seakings and 12 squirrel helos with 11 super Seasprites to be delivered soon. Destroy the enemy ships and rescue the hostages floating in the water, then return to your ship with your Navy helicopter. Use the radar to help you find the enemy with your helicopter and don't shoot your own ship. To complete each level you must rescue all of the men in the water. Destroy the submarines attacking your ship with your torpedoes to keep your frigate afloat. Patrol boats will attack your helicopter. Destroy them with your torpedoes. Attack helicopters will attack your Seahawk, only your frigate's missiles can protect you from them. ARROW keys to pilot helicopter SPACE to shoot and pick-up survivors. Attack helicopters will attack your Seahawk, only your ANZAC frigate's missiles can protect you from them. If you want to play Operation Navy Helicopter Seahawk games online you have come to the right place! GamesLoon adds new Operation Navy Helicopter Seahawk games every week. This is your game portal where you can find the biggest collection of free Operation Navy Helicopter Seahawk games online. 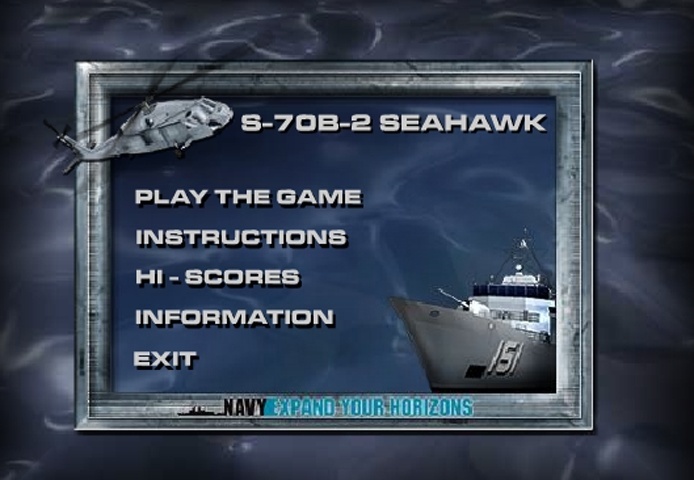 Do not forget to rate our Operation Navy Helicopter Seahawk free online games while playing!